The girth gear has been preferred over the gearless drives due to their lower initial cost, simplicity to install, operate and maintain. In the past many years girth gears have gone through enormous improvements. 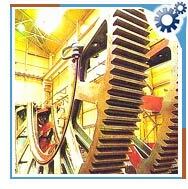 They have high efficiency and the overall life of these gears depends upon proper lubrication and alignment. They are high quality, high precision component. The capital cost of girth gears is lower than others and they take less time to install. They are physically big and due to this they are unable to store for longer periods of time. Girth gear materials have made several changes on their own. Casting is enhanced using full ring risering techniques. Simulation programs are installed for verification of proper solidification. New materials are used with an added advantage of increase in hardness and therefore increased ratings. The girth gear is the heart of most mills and kiln drive system. They can't be used in spare parts inventory. They are also used in steel industry, sugar industry, paper and pulp industry.